though it was not my first dip in the swimming world – that was as a child with Nottingham Northern SC between the ages of 8 to 15. I was too busy with other sports to dedicate all of my time to training but did make the schools County Squad for my endeavours. I first came to Portland when my children joined in 2002 and they were swiftly followed by my nephew and niece. With so many of my relatives swimming at the Club, I just had to get involved. 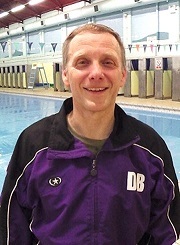 I qualified as a Level 1 swim teacher in 2006, but I have had lots of different roles at the Club over the years – as a parent, coach, swimmer and almost every post on the committee! I am currently Chair ….. again! One constant throughout my time here has been that whatever I’ve done, I’ve continued to coach – from the youngest of our swimmers to the oldest in Masters; and I’ve kept on swimming: though I don’t compete in the Open category for the Club anymore, I train with the Masters swimmers to try and keep my fitness levels up. My own children are adults now, but I’ve stayed on. I love to see our young members get so much out of their swimming and to watch their progress. Portland is a special club.